While it is no longer unusual for teachers to embrace and understand the value of personal learning networks, few are supporting their students in doing the same. I went on a search for educators involved in this work as part of a chapter I am writing for a book on the topic of student liberation being released by Steve Hargadon later this year, In the below Q&A you will get a look at the insights from one of these educators. As you read what this teacher is doing consider how you might integrate such practices into your work. If you are already doing this, please share what you are doing in the comments. Administrator and teacher Sandvika vgs, high school Oslo Norway. Master in School leadership. Wrote Connected Learners with my students. 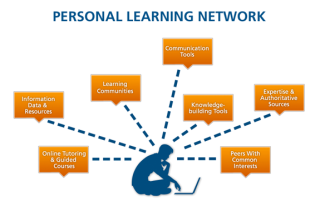 Why is it important to support children in the development of personal learning networks? These days children experience a different way to learn and to socialize than we did growing up. Both learning and socializing are slowly melting into one arena and it is very important that we prepare the children for this. It is noticeable who is popular and who is not. Friends on Instagram and Facebook are very visible to everyone and it is difficult to hide from these places. It is the schools responsibility to show students how important it is to connect and to teach them how to do can it. How do you support children in the development of PLNs? My students write blogs. I connect their blogs to my ownblog (Teaching Using Web Tools at http://annmic.wordpress.com) and I help them get comments on their blogs from other students around the world. These exchanges are very valuable in the student’s learning. I guide them and show them how they can learn from others. What advice do you give to students to help them grow their networks? I tell them to be polite and to respond to all the comments they get. I have been doing this for 5 years now. So far, we have never had any unpleasant encounters. We discuss how we need to check sources when writing and be sure their articles are trustworthy. What platforms do you recommend and how are each effective? All my students have their own blogs and we use Twitter to get in contact with educators around the world and we use Skype to talk. How has having a PLN helped your students? When we wrote and published out book;Connected Leaners, a step-by-step guide to creating a global network (http://amzn.com/B00CYEFX8E) the students could see how valuable my network was. They realized that this is important for them as well. They learn a lot when they read the comments on their blogs, and when they respond. They realize that connecting is the new way of learning and that it is a good way to get more facts and different sides of the story. Not to rely on textbooks alone, but to connect with people who actually live in different parts of the world. How has your teaching been affected when your students now have their own learning networks? The days when the teachers had all the answers and students had to rely on teacher and textbook only are over. Information is everywhere. As a result, students need different qualifications today. They need to be able to know where to find information, who to trust, and what to use. Share a couple of the most powerful examples of how a student’s PLN has been of value? When writing our book we had some students who doubted if this project was worth pursuing. I was able to communicate withSilvia Tolisano (https://twitter.com/langwitches) and she suggested a Skype talk with my students. They prepared some questions in advance. While talking with Silvia they started to believe in the project and their ability to contribute with a book other educators would consider reading and learning from. Silvia later wrote about our bookon her website (http://langwitches.org/blog/?s=connected+learners). It was a valuable moment for the students when they realized the power of being connected. Have students met members of their PLN face-to-face. If so, how was that? How did you ensure your students are doing so safely? What is your advice to teachers who want to support their students in developing a PLN? My advice to teachers is to use blogging, twitter and Skype to connect and learn. It is important to note, however, that there should be a scaffolded approach. First the teacher needs to do this. Once he or she has a personal experience and understand how it works, they are ready to invite students to follow suit. This is important because educators need to be examples for their students. Only then will they see the true value of this. What else do you feel is important to share? I think the most important thing to share is this; no matter where you live, the United States, South Africa, China or Norway, we have a lot to learn from each other. It seems like educators in my country Norway tend to think they know it all and that they have all the answers. They don’t! In addition, it is not only when the Pisa results are published that we need to look at what goes on in our schools and try to improve. We need to work on improving all the time and we need to learn from others, both students and teachers! We need to communicate with others and we need to be open to new ideas! Constantly and actively!